We all went to another of Meg's games tonight. The reds and I got there early enough to hear the introductions of each team. Mickey was announced as one of the coaches. I don't know how much he physically coaches them, but vocally, I don't doubt. Well, tonight I got to sit right behind him as he coached. As the game went on his voice was getting more and more strained and scratchy. At one point I was tempted to tell him to tell me what to yell just so it could get said loud enough for more than the people around him to hear. He made it through the game, barely. Besides all the verbal coaching he does, his biggest responsibility is to keep the book. You can't just let anyone do that. It takes a very smart and observant person to do that. I love keeping score. 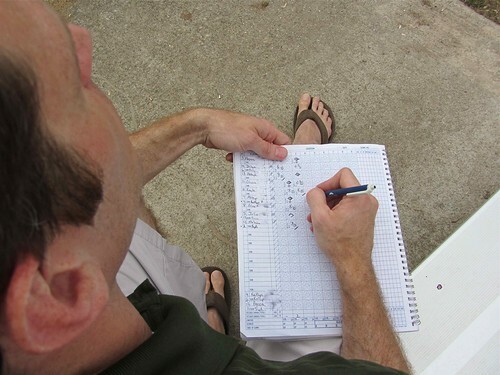 When we were first married we bought a scorebook that we take with us to every game we go to so I can keep score. . . and it's kinda like a journal too. Now we can look back and see all the games we've been to over the years- mostly pro and some college ones too. I absolutely love it. And I look forward to being a score keeper for my own kids one day! Seriously, I would love that. You know, I just love everything related to the game of baseball!